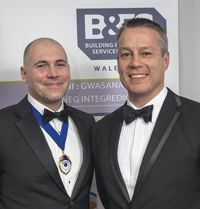 B&ES (Building & Engineering Services Association) Wales has donated £1,700 to local charities following the first social event it has held since its formation in February this year. The proceeds of a prize draw held at the event - a dinner dance hosted by B&ES Wales chairman Andy Tonkin at the Vale Resort, Glamorgan - was divided between Solas Cymru, which provides housing and educational services to vulnerable and homeless young people, and a fund created in support of Caroline Francis, a 52-year-old mother-of-two who has had both legs and hands amputated after developing septicaemia. At the event B&ES president elect Andy Sneyd reminded his audience of the formal launch of B&ES Wales, which had taken place in the Senedd - the home of the Welsh Assembly Government - just a few weeks earlier. He stressed that the need to be heard on the issues of the day was of ever-increasing importance at a time when the construction industry and the building engineering services sector were facing fundamental change in an increasingly digitalised age. Such change was affecting technical and quality standards, concepts of energy efficiency, the reduction of carbon emissions, workforce terms and conditions, the relationship between all parties to the construction process, and the expectations of the marketplace. In addition, he cited securing better payment terms, addressing growing skills shortages and raising awareness among clients of what building engineering services contractors could do for them as key priorities for the Association and the sector it represents.